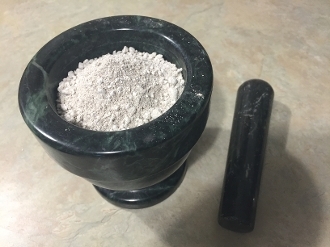 This White Powder Gold was made using a variation of the John Hudson method with Azomite, Organic Dolomite Lime, and reconstituted Dead Sea Salt Water. This precious powder has been lost to mankind for thousands of years. It has been called many things through the ages. It has been called MFKZT, the Fruit of the Tree of Life, and Star fire-Gold of the Gods. More recently, it has received wide notice as the Philosopher`s Stone. It is the crown jewel of Western legend, the stuff of literature. Laurence Gardner explains that the white powder of gold has been known to the initiated few for millennia. Now, you can experience the forbidden fruit for yourself. The ancients believed this substance would facilitate extraordinary life-spans, and cure many diseases by allowing the body to operate as close to perfection as possible. We would say today that it would vastly increase the ability of each cell to conduct electrical impulses, almost like a high performance re-wiring job for the entire body. Azomite (pronounced ā-zō-mite, officially all-caps AZOMITE) is the registered trademark for a complex silica ore (hydrated sodium calcium aluminosilicate) with an elevated ratio of trace minerals unique to the Utah mineral deposit from which it is mined. When the ash from a volcanic eruption filled a nearby seabed an estimated 30 million years ago, the combination of seawater, fed by hundreds of mineral-rich rivers and the rare earth minerals present in the volcanic ash, created the deposit’s distinctive composition. Mineralogically described as rhyolitic tuff breccia, the geologic characteristic of its surface is referred to as an outcrop known as a hogback. Scientific analysis of this combination of volcanic ash and marine minerals reports over 70 trace minerals, many recognized as essential by the National Research Council of Canada. A typical analysis of an Azomite sample using spark source mass spectrometry reveals the presence of many rare earth elements. Azomite is not approved by the FDA for human consumption. Weston A. Price Foundation founder, Sally Fallon, considers Azomite's bioavailable trace mineral content to be a superfood; beneficial to human health. Other alchemist have used Azomite when making WPG and have noticed large amounts of Iridium and Rhodium followed by Gold as the next highest element. This makes is a sort of M3 powder since is has large quantities of 3 of the Noble elements.